aliaLGBTQ e-list now has a Twitter account…but no e-list | Catalogue This! So the application to have the e-list went in last week, and we are now waiting for ALIAs IT guys to work their magic and set up aliaLGBTQ. BUT, today is the last day of July, meaning #TweetAugust starts tomorrow, and there is no way we are going to miss out on the fun, just because we don’t officially exist yet! So, the Twitter account for aliaLGBTQ was born! While it was recognised that usually only ALIA groups really use social media such as Twitter, it was decided that aliaLGBTQ would benefit from Twitter involvement, in that it would create awareness within the librarians-who-Tweet circles, and would help get the word out. In addition, it is the hope of the organisers that with increased membership and participation, that our e-list will eventually morph into a fully-fledged group. Sorry about the size…we needed it big enough to read! Now we just need to figure out what to Tweet about this month. I have a few links to book lists, relevant blog posts, and an awesome picture of some lesbrarians, but I reckon we will be struggling by the end of the month! 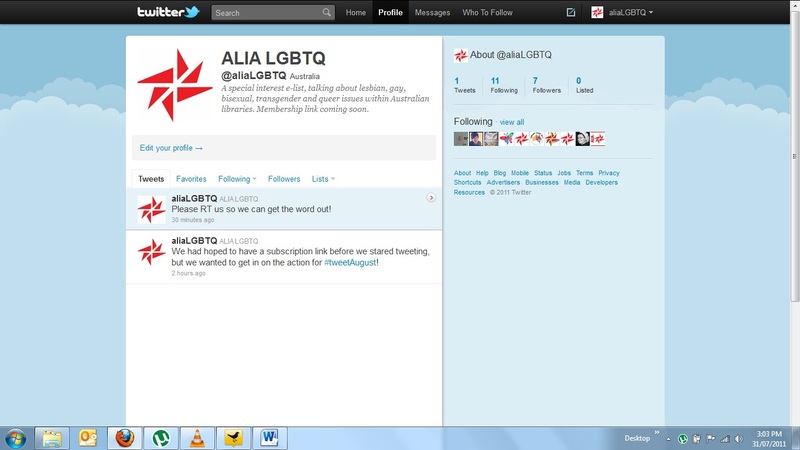 Keep your eyes peeled for the aliaLGBTQ e-list subscription link, coming to a Twitter feed near you!